When Queen Elizabeth II brought the term “annus horribilis” into modern usage in 1992, she used it somewhat solipsistically, referring to scandals that rocked the Royal Family. 2016 will go down as ‘horribilis’ for the rest of us. Zika, terror, vanishing planes, Brexit and its ongoing fallout in politics and society, the disturbing re-emergence of the far-right around the world. The deaths of Bowie, Alan Rickman, Marvin Minsky, Umberto Eco, Harper Lee, Alvin Toffler, Kenny Baker [R2-D2], Prince, Leonard Cohen, Fidel Castro. People die every year — and more famous people are going to die, more often and more visibly, as the population ages and we share their obits across Twitter. But the figures who died this year, set against the backdrop of negativity, inequality and polarization, seemed..symbolic. As though certain kinds of ideas were being snuffed out. Hopes for progress have been re-set. Humans get more tribal when they feel resources are scarce — they favor the in-group at the expense of out-groups. “Classic social psychological research demonstrates that it is very easy to pit groups against one another if they are competing for a scarce resource. Remember the television show Survivor? Therefore, one cause of racism may be an innate proclivity towards group conflict in the service of resource acquisition. And ultimately, under the right circumstances, this can lead to civil unrest and conflict. This “extremely problematic and maladaptive” tendency has been manipulated by demagogues across the world, [especially when the seemingly scarce resources are all being grabbed by a one percent group], who are far more in tune with the true thoughts, feelings and behaviors of the overall population than journalists, pollsters, politicians or advertising agencies, who seem increasingly removed from it. The CEO of one of the world’s biggest advertising agencies summoned his top executives after the election to discuss what could be learned from the surprising result. Even our ideas of what constitutes progress are no longer aligned, the American Dream fractured into a black mirror. Marketers are suggesting that aspirational messaging itself might even be harmful to their businesses. That the idea of aspiration might be offensive. I saw Rogue One on Monday December 19th, 2016, the day the electoral college of the United States of America voted a reality TV [i.e. fake] tycoon president. Not for the obvious reason of plot — all Star Wars films are myths about fascist empires crushing the freedoms of many of races under the guise of galactic security — but rather for what it is: the apotheosis of nostalgia culture. My initial reaction was that Rogue One is a perfect Star Wars movie. It splices plot elements from IV and VI together into a new historical prequel, as Episode VII retold New Hope with a new generation for a new generation [and gender, finally]. Myths often work this way, evolving a narrative over time, using the same elements or mythemes. But normally this is to pull the narratives into the present, or push them forward in some way. In Rogue One’s case, the story fits perfectly into an already existing narrative universe. It slips seamlessly into canon. You watch it, and never for a second, do you think this is not part of the same universe, the same stories told over and over. It’s both the ultimate homage to Star Wars and a true Star Wars movie in its own right, the unattainable ideal of fanfic and geek culture. The new Star Wars films are specifically designed to look like the first three, as a reaction to the reaction to the prequels, to make them fit into the existing story schema. “This is no reboot. With The Force Awakens, Abrams is marshaling the same actors, writers, designers, and even the same composer to reanimate the char­acters and themes that made the original Star Wars into, well, Star Wars,” writes Scott Dadich interviewing JJ Abrams. It’s the ultimate expression of the culture time loop we’re trapped in. Culture has been recycling itself faster and more obviously than usual in the last decade or so. In Hyper-Normalization’s terms, we can see this as a rejection of complexity. Media fragmentation accelerated after we nervously entered the third millennium, frightened of bugs and ghosts in our machines. The television show and global phenomenon Friends was the last truly universal media moment. The mono-culture of mass media shattered into slivers, slowly sliding away from the centre. 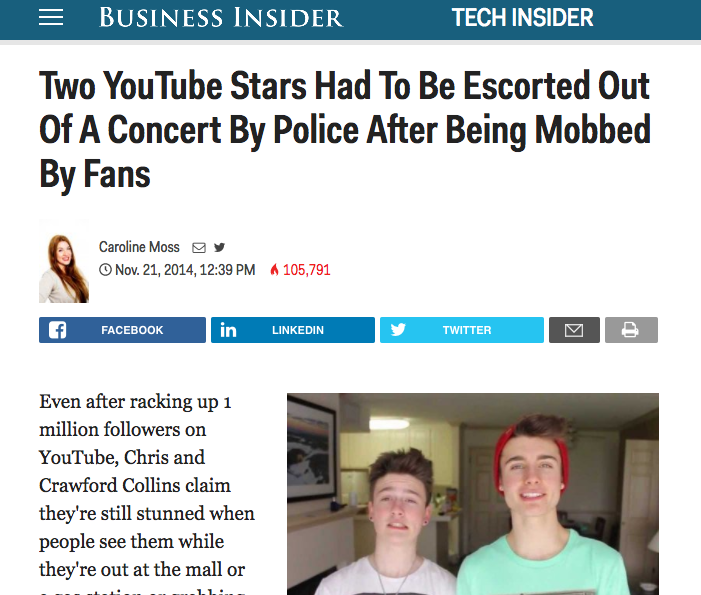 Here Youtube stars distracted the audience at a One Direction concert, a place where their two different kinds of fame overlapped. Making something famous — the primary job of advertising — became much harder almost overnight because everybody was consuming different media. Famous could now mean famous to some people, but unknown to everyone else. A video can have millions, or billions, or views on Youtube, and you and I will never hear of it. Thus things that were already old-school-to-everyone-famous were suddenly more valuable, because pre-fragmentation fame meant to everyone. Attention became much more valuable because it was much harder to aggregate in mass quantities. At the same time, as we the people began to realize the long tail was eating up big chunks of attention, splitting us up, we began looking for things that could pull us back together. If you were a rock star before fragmentation, you could take your audience with you and cut out the intermediaries. But for new artists, or films, the environment no longer supported scale, for the vast majority, because building new audiences, regularly, which is what movies studios and labels do every single time they release a product, became too difficult. Even in the always hit-driven business of culture, where one outsized return pays for a portfolio of ten average performing movies, it became harder and harder to manage risk. So the culture companies doubled down on existing intellectual properties that were already famous. Disney buying Star Wars and Marvel. So. Many. Reboots. With even more coming. That aren’t really reboots at all but extensions or homages, with the weight of in-jokes and allusions to itself pulling against any freshness to the narrative: The voice of Optimus Prime in The Last Knight Trailer is the same voice actor as it was in the 80s cartoon. The director of the Ghostbusters remake thought it suffered for having too many references to the old film. These nods to the audience should be understood as forms of dramatic irony rather than allusion. The power of meta-textual references is that they pull the story into a larger world, multiplying meanings. Self referentiality cannot do this. Arena shows are disproportionately made up of classic pre-fragmentation famous rock bands. The sound of modern pop music takes us back to the 80s. Superheroes are the quintessential modern American myths, invented by immigrants fleeing persecution from Nazis. They are an updated pantheon, a obvious echo of the Greek Gods, providing America with a set of stories through which to understand itself. The relatively recent mass market appeal of these myth structures seems very relevant if not prescient, as we shall see. Yes, I’m aware, that I speak, at length, about creativity as being recombinant, that originality is a myth, that everything is a remix. These aren’t remixed to ignition, they are remade to ignore. They are designed to fit in with our old stories and cover us in the warm glowing warming glow of nostalgia for halcyon days, playing to our natural tendency to fall for the Golden Age fallacy. 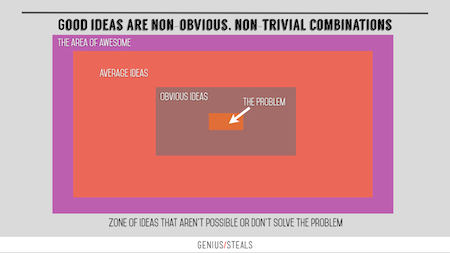 Ideas are new combinations, pushing incongruous elements together in a satisfying way that feels non-obvious. “Immature poets imitate; mature poets steal; bad poets deface what they take, and good poets make it into something better, or at least something different. The good poet welds his theft into a whole of feeling which is unique, utterly different than that from which it is torn; the bad poet throws it into something which has no cohesion. Modern pop is musical formulae, lifting elements from previous songs and reusing them, but disguising the lift, rather than using it as a sample, a reference, imitating not stealing, and pulling endlessly from the same body of work, proximate in time, language and interest. This lift from a 2005 song is no longer an unusual approach. In fact, what the music industry calls “interpolation” is in some ways an attempt to “franchise” pop songs, daisy-chaining them together. Again, all culture is appropriation, always has been, nothing can come from nothing, one cannot invent without inventory. All art is a comment on that which came before. The difference is in the intent: to drive forward to explore strange new worlds by leveraging the existing, or to harken back, to lock something into the past. The mark of art, of good ideas, is that they pull together two incongruous ideas into a “whole of feeling” that satisfies our brains desire for connection but is non-obvious, hence we get a hit of familiar to help us understand the strange. Modern pop songs are a sea of sameness, replicating successful elements faster and faster, until the whole chart sounds exactly the same. Closer, the number one hit smash of the year is a higher-order mashup of many disparate elements, instead of a straight copy. “The sonic similarities of most chart-toppers sound closer than ever. Compare that to this mashed up creativity that spawned a whole new genre of music, explicitly by not following the rules of the music scene or machines they were using. Or the mash-ups of Eclectic Method and Pogo, that use existing materials as a bank of material from which to create something that feels whole and wholly different. Back in 2010, Jaron Lanier suggested in his first book You Are Not A Gadget that music is no longer birthing new genres as it did reliably in every decade prior since the emergence of mass media. When I met him just after the book came out [at a gig at Microsoft Research where he works], I challenged this as perhaps being an aspect of his age. As we get old we tend to lose our appetite for the culture of youth and we have more in our heads for everything to sound like. Now, six years later, as I’m approaching forty, I find myself echoing his [now, to my mind, prescient] thoughts and thus the same challenge could be leveled at me. But the thought is obviously reverberating across lots of minds right now, none more brilliantly than the auteur who writes America’s last truly satirical television show: South Park. The last era of South Park has been noticeably different to that which came before. It started working with a number of multi-episode plot elements, especially around the rise of fake news and its inherent relationship to advertising tracking and targeting. 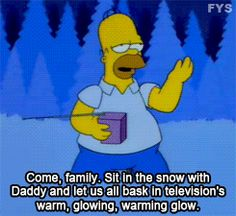 The stand out creation of this season are the Member Berries. These magical sentient fruits let you enjoy and re-enjoy the [warm, glowing] culture of your youth. Trey Parker’s genius insight sneaks in later, as we see that the berries also remind you of a time when they were less immigrants and marriage was only between a man and a women. So, in the face of complexity, we retreated back into cultural nostalgia, which has been used a vector for social recidivism, re-opening the Overton Window — the window of discourse — to outright bigotry that we thought was no longer acceptable to utter in polite [or any] company. As always, South Park is on both sides of the culture war- the over aggressive policing by PC Principal is one of the factors that leads to the Member Berries. None of which is to say there is some insidious conspiracy in cultural production. Rather, popular culture is reflection in which we see our concerns, our hopes, fears and dreams, through a glass, darkly and our cultural imagination has pivoted, driving by looking at the rear view mirror. 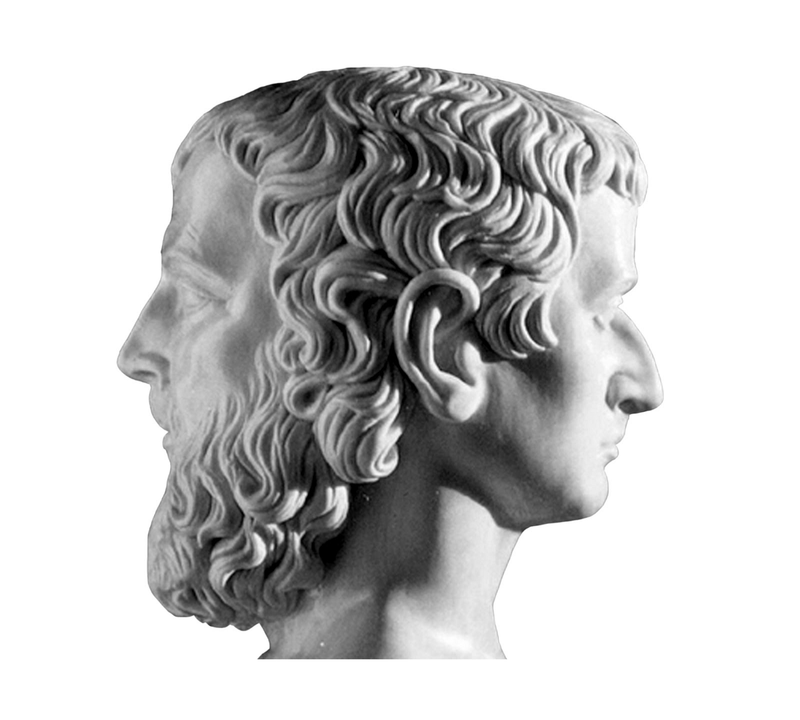 Janus was one of the oldest Roman Gods, sometimes called the god of gods. He was the god of beginnings, gates, transitions, time, doorways, passages, and endings. He represents liminal spaces, moments of transition when old identities lose cohesion and new ones are yet to form. He is represented as having two faces, looking backwards into the past and forwards into the future. To me this represents two different ways of imagining ourselves out of the status quo anxiety of a complex present: dreaming of a brighter future or harkening back to an imagined brighter past. Progressives imagine a brighter future, conservatives a brighter past. And whichever takes hold of the popular imagination drives society. Learning from history to create a new future means we can enjoy our cultural nostalgia in moderation — but trying to pull the present back into the past is, by definition, regressive. One of the human being’s greatest strengths and vulnerabilities is our ability to habituate to pretty much anything — to normalize. We save cognitive resources using our attention system to filter for patterns and pattern interrupts. And so when we woke up in a new world, or found out the world had been very different from what we thought, we began to normalize that too. Rebuilding our cognitive models of the world, using media hot-takes to re-write a narrative that is still so nascent it hasn’t really begun. The normalization of Trump is a media strategy, seemingly confused by the obvious cronyism of his appointments, who seem to be actively opposed to the departments they are now heading, appointing a conspiracy theorist as national security advisor, gross profiteering by charging for access to his family and thus his ear. Some fear that pushing too hard against normalization into Godwin’s Law territory will overlook the petty kleptocracy. But Trumps’ campaign effectively suspended Godwin’s Law since it’s no longer a statistical law about the comments on the internet — it came to life and got elected instead. It’s not Godwin’s Law to mention Nazis when talking about white supremacists. It seems all a bit too ridiculous. As atrocities happen in Aleppo, he attacks Vanity Fair. This makes people crazy angry. None of which seems to make any sense. The Russian propaganda model is high-volume and multichannel, and it disseminates messages without regard for the truth. It is also rapid, continuous, and repetitive, and it lacks commitment to consistency. Although these techniques would seem to run counter to the received wisdom for successful information campaigns, research in psychology supports many of the most successful aspects of the model. This is obviously a perfect description of how Trump communicates. It’s a strategy designed to erode trust in everything. “Over the last 20 years we’ve lived through a communism we never believed in, democracy and defaults and mafia state and oligarchy, and we’ve realized they are illusions, that everything is PR. 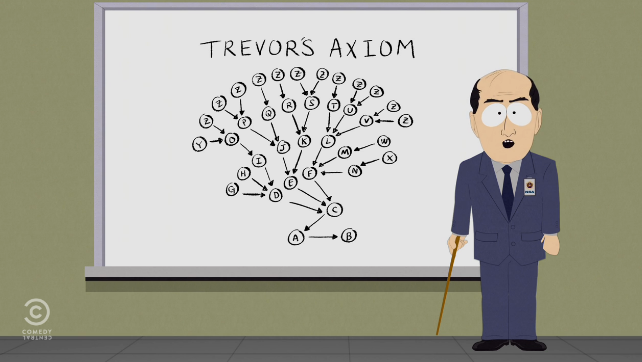 South Park’s explanation of Trevor’s Axiom of trolling — which is their own coinage but explains the social dynamics of the age of outrage to a T-Bill, whereby one person can create oversized responses by attacking a carefully selected person and waiting for the self righteous backlash of the many, which in turn creates a counter-wave and so on. This is exactly what Trump is / does on Twitter, attacking individuals, entities, countries, whatever, and generating a huge response. So you can clearly see how Trump is working to a script, trying to create a reality distortion field so powerful it envelopes the USA and the world. We would do well to remember in the coming years that no institution is beyond criticism. “There can be no doubt of course that criticism is good for people and institutions that are part of public life. The weird thing about Rogue One’s perfection as a Star Wars film is that since it is set in the past of the primary Star Wars narrative, we know what has to happen. War is inevitable since we are trapped in a pre-exiting narrative of endless conflict. As above, so below, since endless war is required to feed the military industrial complex in the USA [and UK] created during WWII. If echoes have been evident in culture for some time, they have become evident recently in world politics, in a deeply alarming, obvious way. “No, this is not Sarajevo 1914,” tweeted Turkish columnist Mustafa Akyol, referring to the assassination of a Habsburg royal by a Serbian nationalist that preceded World War I. We are entering a liminal time. If 2016 was our “annus horribilis”, next year will be the “annus Janus”. The world is unstable, certainties have been swept away, identities are in flux, new narratives have yet to form. We all have a chance to help re-write the story of America, of humanity, one way or the other. Especially those of us in the fields of cultural production, in whatever form. The danger is to let the nostalgia narrative conceal what can lie beneath. The Stormtroopers in Star Wars were named after an earlier set of Stormtroopers, ones we used to see everywhere in culture as an — as THE — unmitigated evil, one that we see less and less as the generation that fought them died off. Memories are short and malleable but if we let near-term nostalgia make us forget actual history, the dangers of it happening again are very real. Not those Stormtroopers! The real old ones. @Faris is the co-founder of strategy & innovation consultancy, Genius/Steals and the author of Paid Attention [Kogan Page, 2015]. Subscribe to their weekly newsletter full of interesting things that will help you have better ideas: Strands of Genius. Thanks for making it to the end! 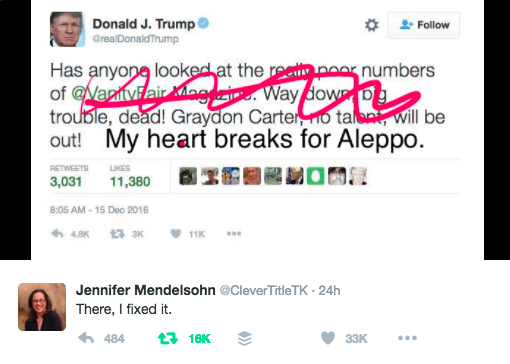 Since you did, it be super nice of you if you would click the heart and/or share buttons just below. It will help other people find this essay and take the time to read it, generously giving it their attention — and will squeeze out a tiny drop of dopamine in my brain.